JUNE 5th Race to the Finish Line..Help Create the Coach Hughes Scholarship! Please join us at the Resetco-Ring home as we salute TC Coaching Legend Mike Hughes! We’ll honor Coach Hughes with a reception on June 5th and raise funds to create “The Coach Mike Hughes Scholarship,” which will be awarded to a 2019 T.C. Williams Titan with financial need next spring. Coach Hughes has been a T.C. coach and teacher for 25 years and was recently named the 2018 Winter All-Met Coach of the Year for Boys Indoor Track and Field by The Washington Post. Coach Hughes is also a homegrown Alexandrian and a 1974 T.C. Titan! He knows the importance of giving back to support the Titan community. If we can raise $3,000, Coach Hughes will be on stage next spring to award “The Coach Mike Hughes Scholarship “to a TC Titan in need. Click for Tickets or to Give! JUNE 7th A Rousing Danke Schön for Our Amazing ACPS German Faculty! During this year’s German Awards Dinner at their home, Frau Susanna and Herr Steve Carey are collecting contributions from current and alumni families to support a German Faculty Scholarship. 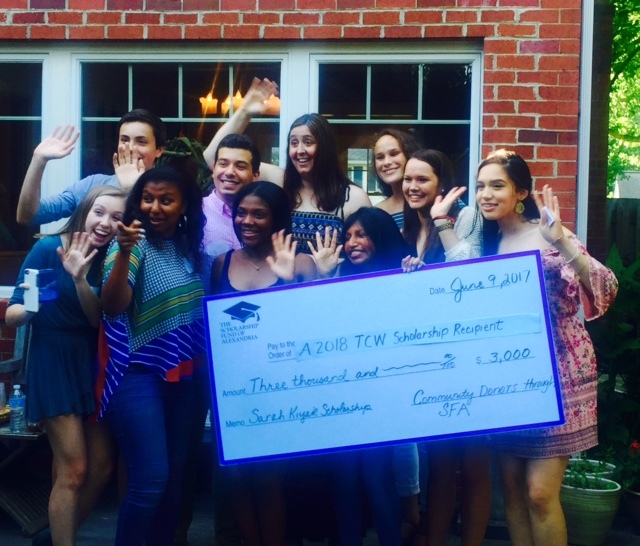 The scholarship will be awarded to a TC Williams Class of 2019 Graduate. Herr Levine, Frau Connelly, Frau Mayer-Harding, Frau Johnson and Herr Schilling will be invited to award the scholarship on stage at T.C. Williams next Spring. Click for Tickets or to Give! JUNE 7th The Limit Does Not Exist…Join us in Honoring Mr. James Slater! Please join the Arndorfer/Bernstein family in saluting Mr. Slater at a casual Dessert Reception on Thursday, June 7th from 6:30 – 8:30 pm. In addition to thanking a great teacher for his commitment, we will be raising funds for the Scholarship Fund of Alexandria to create a scholarship in Mr. Slater’s name. We’ll toast Mr. Slater, mingle with ACPS friends and enjoy some sweets. If we succeed in raising $3,000, “The James Slater Scholarship” will be established and awarded next spring. Click for Tickets or to Give! 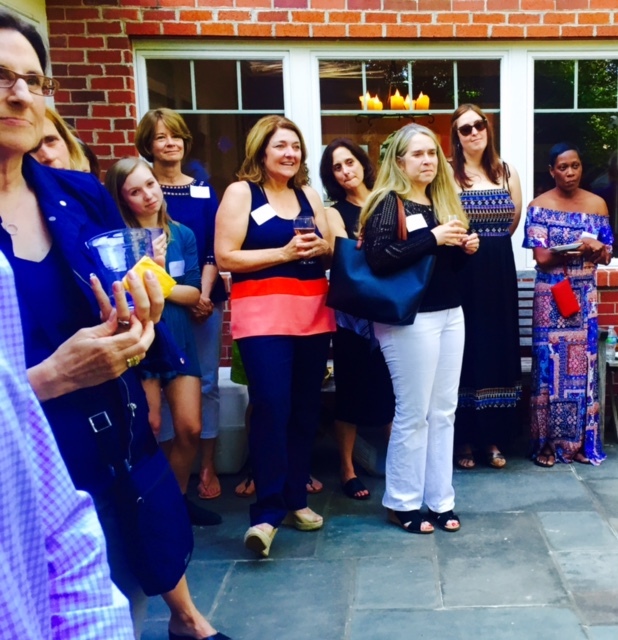 JUNE 8th Give it up for Dr. Lois Berlin — A Party & A Scholarship! Please join Rosie and Mark Wiedemer to celebrate and honor Dr. Lois Berlin for her decades of service to Education & Alexandria! We’ll honor Dr. Berlin as she completes her tenure as Acting ACPS Superintendent with a wine and cheese reception. We’ll also help raise funds to create “The Dr. Lois Berlin Scholarship” — a college scholarship that will be awarded to a 2019 TC Titan graduate with financial need. Dr. Berlin has been a tireless advocate for educating Alexandria students — serving as principal of George Mason Elementary School for six years and principal of Jefferson Houston Elementary School for four years. She has truly been a champion for out kids, let’s champion her with a fun night…and a scholarship in her name. Click for Tickets or to Give! JUNE 9th English Dept. Outstanding Teaching Scholarship for Ms. Grayson & Ms. Taylor Sponsored by Mark Eaton, Matthew Zahn, and the Hon. Veronica Nolan. T.C. Williams English teachers Michele Grayson and Laurel Taylor leave an indelible mark on their students each year! Please join us in expressing our gratitude for all they do for our T.C. students. We are gathering the Alexandria community to show our appreciation. Our goal is to raise $3,000 so that a scholarship can be awarded in Ms. Grayson and Ms. Taylor’s honor to a T.C. Williams graduate (who shows financial need) next year. Please help us get to the $3,000 goal and beyond! And enjoy a delicious dinner of Pork Barrel BBQ, beer from Port City Brewery, wine and dessert. All contributions are 100% tax-deductible! Click for Tickets or to Give! JUNE 10th Help Celebrate Ms. Angi Green AND Create a Scholarship in Her Name! Did your George Mason Dragon have an Ahhhmazing Year because of Ms. Green? Did her Energy, Enthusiasm and LOVE for teaching make it the best year yet? 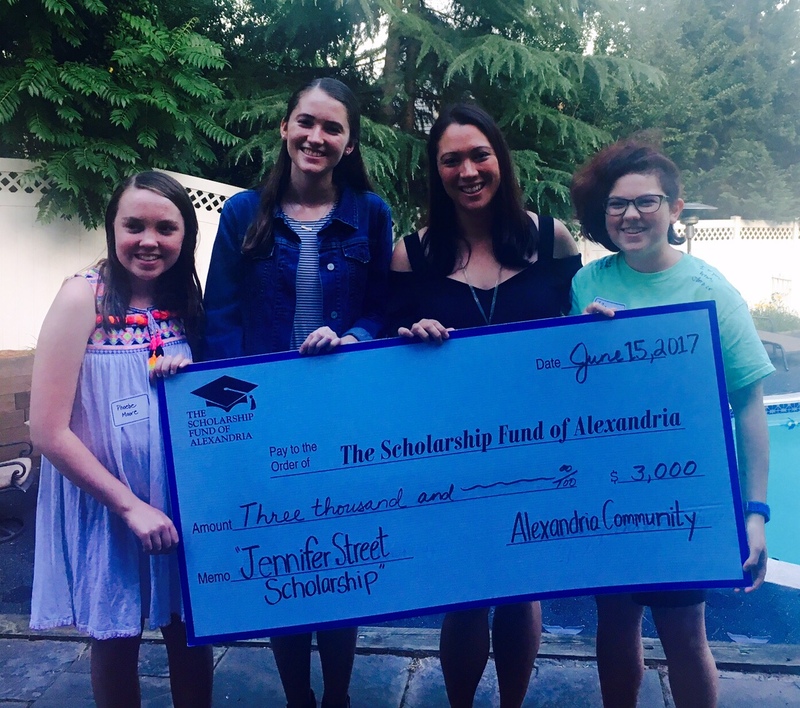 Please join the Scholarship Fund of Alexandria and host Laurel Conger on June 10th to salute Ms. Green with an afternoon party AND a Scholarship. It will be a great afternoon to gather with GMES friends, thank a great teacher for her commitment, and raise funds to create “The Ms. Angi Green Scholarship,” which will be awarded to a TC Williams student with financial need next spring. All parents, students and alumni families are welcome to attend the event. You can contribute even if you cannot attend on June 10th. If we succeed in raising $3,000, “The Ms. Angi Green Scholarship” will be awarded by Ms. Green on stage at T.C. Williams next spring. Click for Tickets or to Give! JUNE 14th Celebrate the Creation of the “Arthur Harris Scholarship!” Please join us as we Honor the One and Only Arthur Harris with a Party & a Scholarship. 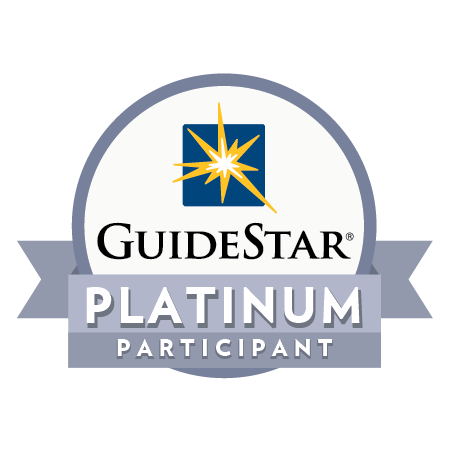 Do you have a MacArthur Star — Past or Present? Chances are they think Longtime MacArthur P.E. Teacher Art Harris literally Hung the Moon! The man KNOWS EVERY STUDENT’S NAME –– Past or Present! He is such a positive force in our children’s lives and a MacArthur Treasure! We’ll gather for Desserts & Drinks on June 14th, salute Mr. Harris AND raise funds to NAME the “Arthur Harris Scholarship” in his honor. The scholarship will be awarded by Mr. Harris on stage next spring to a T.C. Williams graduate with financial need. Click for Tickets or to Give! What is an Honor-a-Teacher Party? Our annual Spring Honor-a-Teacher Series is a great way for parents and community leaders to say thank you and celebrate an ACPS teacher or staff member AND raise money for a scholarship in the teacher’s honor at the same time. Each spring parents come forward and volunteer to host a party on behalf of their child’s beloved K-12 teacher. 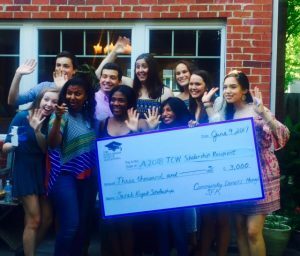 The Scholarship Fund works with the host(s) and the teacher to schedule the party – creating an online party invitation and collecting contributions toward the party. When the party raises $3,000, a scholarship is created in the teacher’s name and the honoree teacher is invited to hand out the scholarship during our award ceremony to a T.C. Titan with financial need. Every dollar raised toward these parties goes directly to support a college scholarship for an Alexandria student in need. All contributions are 100% tax-deductible. Who do you Honor at these Parties? We’ve held parties for celebrated 1st grade teachers, departing elementary school teachers, retiring elementary school principals, popular middle school band directors and for many, many T.C. teachers and coaches throughout the years. Parents come to the Scholarship Fund with great suggestions each year – sometimes a special teacher gets a party every year! The love and support of parents and students and the local community are what make these parties so popular and so very special. How Can I throw a Party? Want to help throw a party for a beloved ACPS teacher or employee and help create a scholarship in their name? Email us today: scholarshipfund@acps.k12.va.us Most parties are held during May, June, August and September.